The personal information on this form is collected under authority of the Municipal Act SO 2001, c. 25. Questions about the collection of personal information should be directed to our Call Centre by dialing 3-1-1 (within Brampton city limits) or 905.874.2000 (outside city limits). Please review the City’s Privacy Statement for more information. 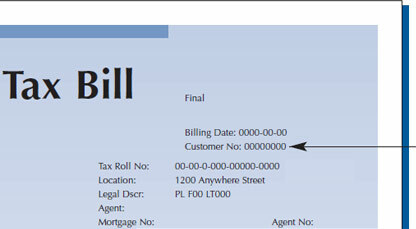 Customer Number: Your tax bill includes a Customer Number on the upper right hand corner of the bill. The Customer Number is required to obtain account information.